You can tell a lot about a contractor based on what others are saying about them, particularly their customers. The old advice of “ask for 3 references” is just too easy to fake. You most likely are calling best friends, siblings and even parents. You’ll need to get a little tougher with your contractor to protect yourself. Insist that any contractor you are considering can produce the following to PROVE that their reputation is rock solid. First, you might want to look at the Better Business Bureau. You need to go further than just checking a contractor’s standing with the BBB. Remember, many contractors shut down and open under new names year after year. So be sure to check to see how long they have been a member, and check to be sure the contractor is accredited by the Better Business Bureau. This means that if complaints arise, the contractor agrees that the BBB’s judgment is binding and must perform accordingly. Without this agreement, you may have no recourse. Kent Mohler Exteriors is a BBB Accredited Business with an A+ rating. Second, accolades and Awards are another important way of looking at a contractor’s reputation. If a contractor has been in business for any length of time and doing a good job they will most likely have been written about in a magazine or newspaper. Receiving special recognition from an association or trade organization says a lot about a business. Any reputable company should be able to produce SOME of these kinds of accolades, if not, tred lightly, they may not be worthy of any kind of an award. Lastly, a good contractor doesn’t just do good work. They also understand that when dealing with customers, it’s oftentimes the little things that make a big difference. You should find a contractor that shows you respect by the way they treat you, the way they look, the way they treat your property, and how they pay attention to details. In closing, when hiring a contractor to do any type of work in your home, remember it’s your money and your home. Be sure you hire a contractor with a good upstanding reputation. 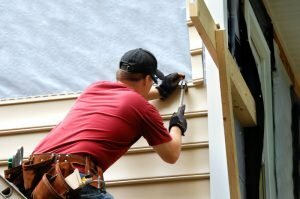 If you happen to live in the Kansas City area and are considering siding or windows, please give Kent Mohler Exteriors a call. Hopefully we can show you, as we have thousands of others, how to make your home absolutely gorgeous. Something you can be really proud of, just as we are with our outstanding reputation!